Have you just started learning Chinese and have often heard about “Traditional Chinese” and “Simplified Chinese” and want to know what the difference is? Do you already know the language rather well and want to know more on this particular aspect of writing? Do you want to know how and when Chinese characters came to be simplified? Have you studied simplified Chinese and would like to learn how to read a little of the traditional Chinese or viceversa? In each of these cases, this article has been written just for you! Why are there simplified characters? Where are the various types of characters used? What do the Chinese think of it? So which Chinese should I learn? Traditional Chinese and Simplified Chinese are the two variants of Chinese writing: so, you don’t “speak” traditional or simplified Chinese, but you write it using one of these two writing systems (you can speak Mandarin or Cantonese Chinese, which are variations of spoken Chinese). They are alternatives. Normally if you’re writing in simplified characters, you can’t arbitrarily insert traditional characters and viceversa. The pronunciation in pinyin is only used in specific cases (for example, in books for those learning Chinese, or in children’s books). The majority of Chinese texts are written in either traditional or simplified characters; many characters though, have not been simplified, and in those cases the traditional and simplified forms will be identical. Classic characters (繁体字/繁體字 fántǐzì) are also called traditional or complex and are those which, with few variations, have been used in China since the end of the Han era (汉朝 Hàncháo, 206 – 220 d.C.), when regular handwriting was established 楷书 (kǎishū). In practice, the characters were already the same or very similar to the ones still in use. Many simplified characters (简体字 /簡體字, jiǎntǐzì) have always existed in cursive form in some calligraphic or correspondence (in letters) form, when in order to write more quickly they connected strokes by forming fast joined lines. The official shape, albeit with a few variations, has remained unchanged since the second century A.D. and it was only in the middle of the 1900’s that the simplified form was made official. Already by the 1930’s and 1940’s the government of Kuomintang (国民党, Guómíndǎng), the Nationalist Party, intended on bringing about an “official” simplification of the most common characters. The purpose was to facilitate literacy, which was a serious problem at the time with hundreds of thousands of people not knowing how to read and write – likely due to the difficult nature of the writing system. Many intellectuals supported this proposition, but it wasn’t enacted. It was the government of the People’s Republic of China (中华人民共和国, Zhōnghuá Rénmín Gònghéguó), which for the first time in 1956 and with later updates, officially spread the simplification of the characters. In 1986 the “General Table of Simplified Characters” (“简化字总表” Jiǎnhuàzì zǒngbiǎo) was published, which is a collection of 2235. In this period, and for the same reasons, pinyin 拼音 (pīnyīn) a system of Romanization (that is the writing of the pronunciation of Chinese characters in the Roman alphabet) was created, which is still in use today. It seems that Mao Zedong’s original plan (毛泽东 Máo Zédōng, 1893-1976), as founder of the People’s Republic, was to eventually eliminate all Chinese characters as a sign of backwardness and a legacy of the “feudal” culture, substituting them with an alphabetic system, as happened for example in Vietnam. The problem of illiteracy is today much less serious, and for this reason simplification has been considered a success. Nevertheless, it’s impossible to establish how much of the effectiveness is due to this “writing reform” and how much depends on other factors such as economic development and the socio-political reforms enacted by the Communist Party during the same time. Simplified Chinese is obviously used in Mainland China (中国大陆, Zhōngguó Dàlù), but is also widespread in Singapore (星岛, Xīngdǎo) and Malaysia (马来西亚, Mǎláixīyà) – states that have a substantial Chinese population and great relations with the People’s Republic. The traditional forms are instead used in Hong Kong (香港, Xiānggǎng), Macau (澳门, Àomén) and Taiwan (台湾, Táiwān), for various reasons. Up until 1999 Hong Kong and Macao were part of Great Britain and Portugal respectively, and therefore they didn’t adopt the new system (and it doesn’t seem as if they have any plans to do so in the near future); Taiwan, instead has always had a controversial relationship with Mainland China, and their refusal of the “new” system promoted by the communist government might be representative of a means of affirming their own independence. In Chinese communities living abroad, they use one or the other depending on where their parents originally emigrated from. Several thousand Chinese characters have also been used in Japanese, some of which like 学 (xué, to study), have undergone simplifications that have also entered into use in China. The majority though are traditional characters. The same word 漢字 (kanji), which indicates Chinese characters in use in Japanese, is nothing more than the traditional version of 汉字 (hànzì), “Chinese characters”, read according to Japanese pronunciation. Lastly, although they’ve been abandoned by now, in Korea and Vietnam they were in use in the past and are part of these countries’ tradition, and therefore necessary for those studying their history. To better understand the differences, I’ll give you some examples of simplified characters next to the traditional form, and will try to explain the reasons for its simplification. You’ll see in some cases that it is possible to find a certain similarity between the two forms (though not always). The “simplest” type of simplification has to do with the way in which single components are written, which as a result has changed the look of all characters that contain it. I said “component” and not “root” or “character” because the part that’s changed isn’t necessarily the root or an autonomous character, but could also be a “sum” of more parts that appeared constantly in many words. Another example that you’ll find very often is 言 (yán), word: this character too has remained the same when used on its own (as in 文言 wényán, literary Chinese), but changes its shape in 讠when it appears as a component. The are however exceptions, such as the very common 這/这 (zhè), “this”, which has assumed the character 文 (wén), while in the cases of 信 (xìn) of 相信 (xiāngxìn, to believe in) or in 警 (jǐng) of 警察 (jǐngchá, police) it has remained the same. Looking at a list of the characters that contain the character 言, you can see the simplification in 讠which takes place especially when the component is found on the left, while when it’s found on the right (信) or below (警) it remains as it is. This though is not an absolute rule: 罰 becomes 罚 (fá, to punish), even if the word’s root is found below, such as in 辯 / 辩 (biàn, to debate), where it appears in the center. Knowing how some components are simplified, you can easily read many characters written in classical Chinese if you know the simplified versions and viceversa. Nevertheless, for many other characters the changes have been more drastic and difficult to explain. In this category all the modifications of the character structures are gathered, which from time to time have lost components, assumed cursive forms or have been completely rewritten. This type of change has brought about an enormous change in the characters, which in many cases are no longer recognizable. Usually you’ll find a list of “motives” for the simplification which are sadly (at least for those who aren’t Chinese) not immediately as understandable as the ones seen above. 1. In some cases forms in cursive, which have already existed for centuries as “alternative versions”, have become the new “official forms”, such as in 發 → 发 (fā, to emit) for example and 東 → 东 (dōng, east). This type of simplification is likely the most easily accepted and recognizable, at least for the Chinese, because it’s simply the same characters written in another style. 2. At the same time, the substitution with alternate forms that have coexisted for centuries and the elimination of variations, which have defined the preference for one version (becoming standard), have acted on the existing forms, choosing those that are less complex to make them “official”. 3. Similarly, for some characters there has been the substitution with similar more simple characters that are pronounced the same way, such as the case with 幹 → 干 (gàn, to do). As already existing shapes, this type of simplification isn’t too “invasive”, and doesn’t present much difficulty being accepted. At times only one part has been substituted, such as the character for wind, 風 → 风 (fēng). 4. In other cases there has been the substitution with a new character, specifically built according to a semantic and phonetic point of view: 響 → 响 (xiǎng, sound), which was built using the root of mouth (口 kǒu) which indicates that the word has to do with something that comes out of the mouth (a sound) and one that is 向 (xiàng) phonetic, which gives an idea of its pronunciation. 5. In yet other cases, there was an actual elimination of a rather large part of the original characters. This method brought about enormous differences between the two types of writing, and it was also the most contested by those who defended the use of traditional characters, since it would have taken away some iconoclastic words that characterized it. For example, from the character 愛 the root 心 (xīn, heart) was taken away, substituting the lower part of the character with 友 (yǒu, friendship): the result is 爱, a “love” without “heart” (During lessons I often joke that bringing friendship into love, they established the concept of the friendzone). At the same time 飛 (fēi, to fly), which was graphically represented by two wings, has ended up with “just one wing”: 飞. 進 / 进 (jìn, to enter/advance), which was originally represented by a type of bird (隹 zhuī) that “goes” (辶 chuò, its root derived from 走 zǒu, to go), now graphically means to go… into a well, 井 (jǐng), which perhaps goes contrary to the idea of “advancing” that the word should suggest. A last example is 聖 / 圣 (shèng), “holy”: initially made up of 耳 (ěr, to listen) and 呈 (chéng, memorial), which also indicated the phonetic part (chéng-shèng), the character “recounts the story” of one that listens to the memorial (the suggestions and complaints of the subjects) and becomes “holy” in that sense. In cases where the existing characters were chosen from the variations or alternative versions that were already there, simplification causes big problems (at least for the Chinese), even if the only way to recognize them is to learn them by memory. On the contrary, simplifications through the components seen above are easily recognizable once you know the transformation that a single component has undergone. Even today there are people who prefer one of the two systems for various reasons. Those that support the simplified system reforms sustain that this represents the natural evolution of the language, underlining the greater ease of use and memorization and the speed of writing. There is no doubt, for example that writing 头 instead of 頭 (tóu, head) is much simpler, even for Chinese kids. After all, traditional characters are known to be similar to one another, especially those made up of many strokes which are hard to distinguish, particularly when they are written small (as in subtitles, or even this article. Fortunately you can zoom in! ), when they are out of focus or written in “artistic” ways, like in shop signs or magazine ads. Reading speed is also greater with simplified characters, which for example, immediately jump out to the eye while scrolling through the subtitles of a song (if you’ve ever seen a music video with subtitles in traditional Chinese then you’ll know what I’m talking about). Today, now that writing by hand is giving way to digital writing, there are however valid arguments. On the other hand, opponents of simplification draw attention to the fact that some simplifications have no respect for the origin and history of the characters, which along with strokes, also remove a part of its meaning, such as what we just saw for example, the characters 愛 and 飛. The case of Taiwan and Hong Kong shows that the language is a distinctive piece of a land’s culture, and opposing the use of simplified characters seems here to also have an “ideological” element. After all, even though both in Hong Kong and the island of Taiwan literacy was always higher than in the People’s Republic, it has not been said that simplification was the actual cause of improvement in the lives of the Chinese over the last few decades. Traditional characters remain part of the heritage of history and classic Chinese antiquity: anyone, whether a native speaker or not, who wants to study ancient manuscripts, will be forced to come face to face with classical Chinese, even on Mainland China. Ultimately, the two systems continue to coexist: on KTV and internet videos, where song subtitles from the divas of Hong Kong are in traditional Chinese, in film subtitles, in calligraphy (which even today has a strong preference for classical characters). 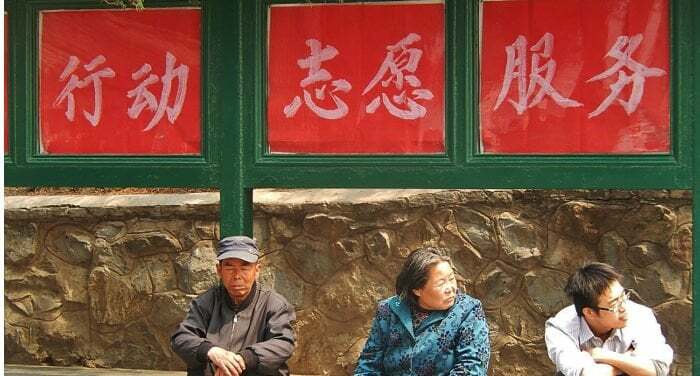 Now that the Chinese government no longer has the aversion to tradition that it once did – and even tends to value it as their national heritage – it seems that simplified and traditional characters will be destined for a peaceful coexistence. Anyone who is starting to learn Chinese, unless they’re doing so in Hong Kong or Taiwan, will automatically learn the simplified characters. Practically all university courses abroad and in China, the courses at the Confucius Institute and various schools where Chinese is taught, use this system, also for the ease of writing and memorization – especially if you’re just starting out. Texts too (language manuals, graded readers, children’s books, etc) using simplified characters are much more numerous than those written in traditional Chinese, even though many have both versions. Learning traditional characters is, in a certain sense, an unusual choice. Nevertheless, for some specific fields of study (history, calligraphy, art, ancient literature, poetry) you’ll have to also learn this type of writing. In the end, the etymology of many simplified characters can only be understood through the traditional forms, which often have a strict relation to the original “pictograms” that were basically simplified drawings of the scene that the character represents. Learning classical Chinese can be very interesting, also because it allows you to understand the “why” of many modern characters’ shape. Whatever your decision or relationship with the Chinese language might be, I hope that this article was helpful to you! Aldo Terminiello (1989), has been writing and drawing since he was little and has done so for one year in Kunming, China where he finished his degrees in Chinese and English. Translated, he illustrates and teaches English and Chinese depending on the case.